I Went Outside – He Said What?! I knew the minute that I laid eyes on Aaron this morning that he was tired and probably grouchy……and I was right. He was having another “I’m tired and I don’t feel well and I don’t want to go to Paradigm” morning. I just poured his coffee, opened the comics as I told him how funny Get Fuzzy was today, and told him that it was a nice morning……….so going outside to the mulch would be a great idea. He dismissed that idea with a grunt, and I made my exit to go upstairs and get in the shower. Later, I went downstairs, steeling myself against Aaron’s certain verbal onslaught……….and found it strangely quiet. There were his empty coffee cups on the table, his pill container and water glass on the counter showing that he had taken his pills, and the rumpled comics revealing that he had read his favorite Get Fuzzy comic. I glanced out the window and saw a splash of yellow out under the trees. 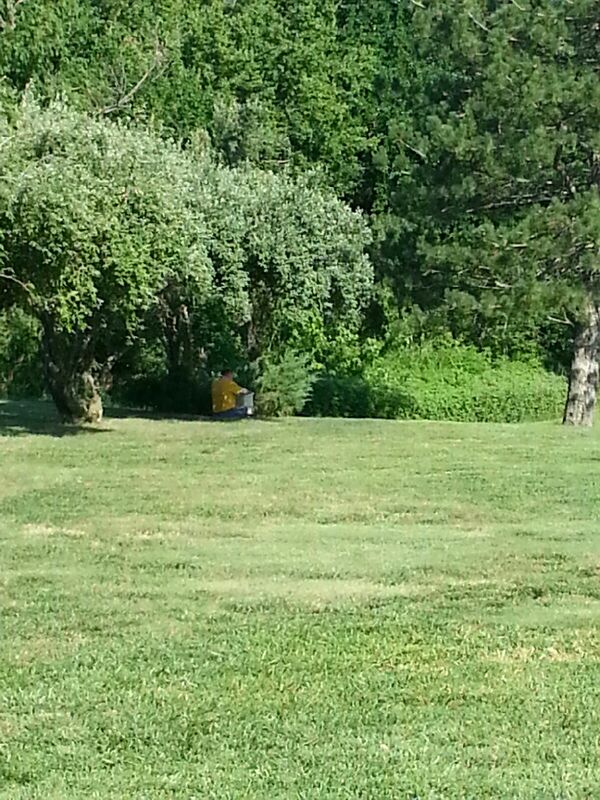 There sat Aaron, wearing his yellow shirt, and fully occupied in the twigs and small sticks there under the trees. He was meticulously breaking each twig and watching it fall into his mulch trash can, slowly filling it even more, piece by little piece. To my great surprise and relief, he happily just said, “OK!” And that was it! Wow! He got right up, and he and I walked to the house, talking about the nice day and how the sun was getting hot. I was still surprised at how much his mood had changed, and was just very thankful that it had changed for the better. As we drove to meet his group, Aaron launched into his topic of the day………robots. In particular, HK47……the robot on his Star Wars Republic game. He talked about everything robot and HK47 that he could think of, and asked me tons of questions that I tried to intelligently answer despite the fact that I am not a robot or HK47 expert. Finally Aaron paused for a breath, and I quickly grabbed the moment to tell him that I was really proud of him for doing so well today. Now this may sound like no big deal, but to me it was huge……….because to Aaron it was huge. Huge for him to be able to convey just what he’s doing as he sits out on the ground, breaking mulch or twigs into his trash can. I asked him what he thinks about, and he told me that he still makes up stories……which I knew that he used to do, but I wasn’t sure if his mind was still thinking up stories. This story making calms him, and the repetitive motion of breaking small pieces of wood is a large part of this calming process. I laughed, and Aaron laughed as he rubbed his hands together, and the spell was broken. The sharing was over as he launched again into robots and HK47……….how he talks and what he says and what he sees and how he moves………. But I was back at his simple comment……..”My mind thinks.” It was like looking into a secret room full of hidden things not ever seen when he made that simple comment. I loved that moment! I loved those three little words that were enormous to me! Somehow that time for him to let his mind think is also a time when he is able to refresh and be calmed. It’s the cheapest, most effective therapy ever………at least for Aaron! I still think I just might join him.